We at TickPick know how big of a decision it is to purchase Super Bowl 53 tickets. As the biggest and most expensive ticket of the year, football fans want to know that they’re ordering their tickets from a company that they can trust. We have a sterling reputation for successfully fulfilling every single Super Bowl order we’ve had in our 7+ years of business, and we save our customers hundreds or even thousands of dollars per ticket to the Super Bowl due to our no fee pricing structure. 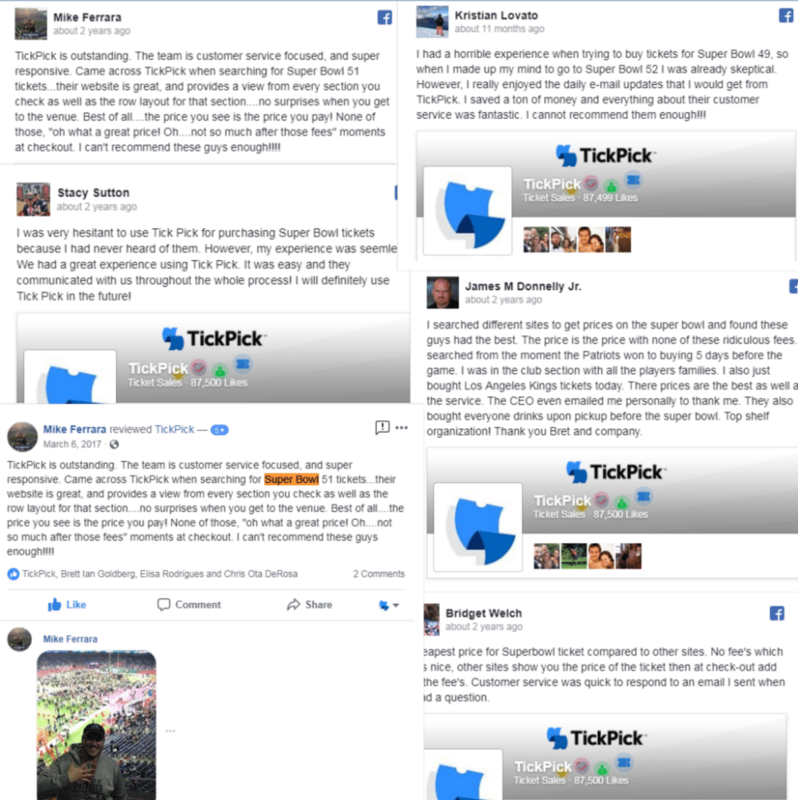 We’ve curated a list below of some of our Super Bowl customer reviews over the past few years from leading review services like Facebook, Yelp, and Google for both Super Bowl LI in Houston and Super Bowl LII in Minneapolis so fans interested in buying Super Bowl tickets from the absolute cheapest and only no fee ticket marketplace can proceed to buy with confidence. 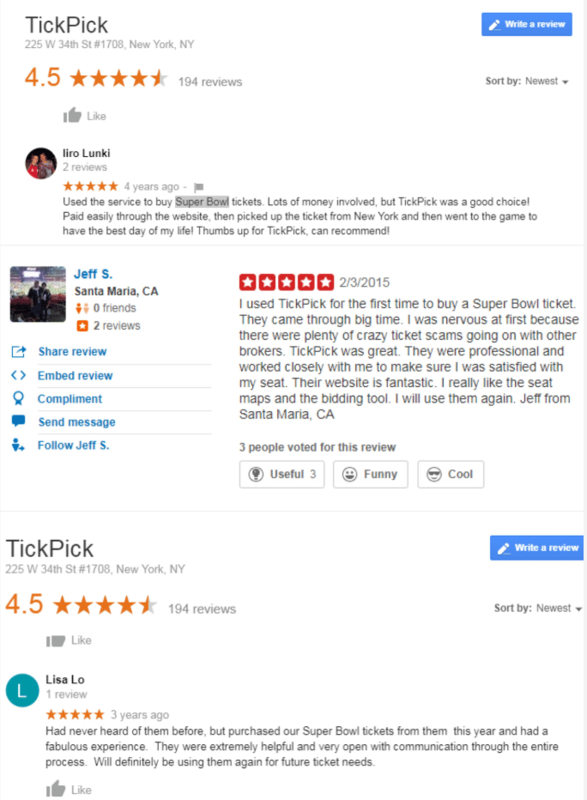 Please keep in mind that TickPick has around the clock Super Bowl customer support that can be reached at any time via our phone line 845-538-4567 or email at [email protected] If you would like to speak to one of our agents about anything related to Super Bowl 2019 tickets, please don’t hesitate to reach out! If you’re feeling good enough to secure your tickets to the event of a lifetime, be sure to check out out prices on TickPick for Super Bowl 53 tickets in Atlanta that will always be cheaper than our competitors like StubHub. While you’re here, feel free to read up on our extensive information from ticketing experts on all things related to Super Bowl tickets. For daily updates on Super Bowl ticket buying advice , we’d advise signing up for our Super Bowl 53 Newsletter below!